New Delhi: It was not only the Indian Air Force (IAF) and the Army that were pressed into action against Pakistan after the Pulwama attack but also the Navy's aircraft carrier INS Vikramaditya, nuclear and conventional submarines and several warships deployed on the western maritime frontier in an aggressive posture. 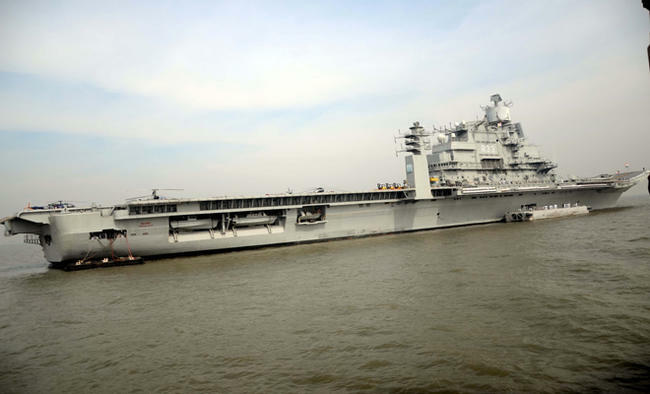 The Indian Navy Carrier Battle Group that was exercising in the area was swiftly moved into operational deployment at the height of the tension between the two countries.The details of heavy naval mobilization has come out in public domain only now as the Theatre Level Operational Readiness Exercise (Tropex 2019) has got over. Around 60 ships and equal number of aircraft had taken part in the war games that had quickly turned into a real time operational situation following the tension.The Navy said the aim of the move was to deter and defeat any misadventure from Pakistan.INS Vikramaditya had the full compliment of Mig-29 K fighter jets and was protected by nuclear attack submarine, INS Chakra. The Indian navy, which is far superior to Pakistan's sea force, demonstrated the versatility to change roles as it operates a large number of combat platforms.The move of such a large Indian combat fleet forced the Pakistan Navy to stay close to the Makran coast and it could not come out into the open sea.Earlier this month, Pakistan had raised alarm that it had detected an Indian submarine in its waters but it was dismissed as a false claim by New Delhi.